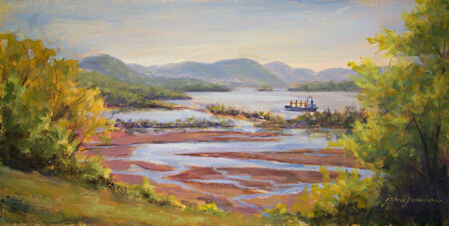 This was painted on location at Boscobel Restoration in Garrison, NY a few weeks ago. It needed a few finishing touches and signing in the studio, which I finally got to do today. This painting is not an exact scene, but rather a composite of elements that were there at the time. There was a row of cherry blossoms in full bloom that were stunning. There was also a path alongside them; however, that path is actually on the other side of the trees, and runs parallel to the river, rather than toward it. I wanted to switch things around for a change, have the pathway lead the viewer’s eyes to the overview of Constitution Marsh, and bring the cherry blossoms into the painting as well. Fortunately, as artists, we can use our artistic license to have our cake and eat it too! This is a painting I did some time ago. 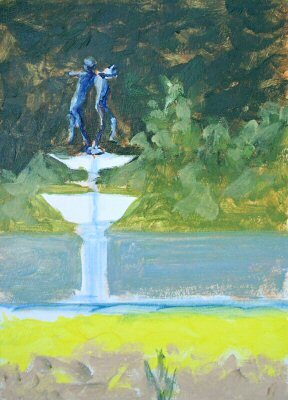 It is seasonal and has always been one of my favorite little garden/fountain paintings, so I am reposting it today. Although this scene was an enormous challenge to paint, I think I had an even more difficult time trying to get the photo right! I can’t seem to get the dark trees in the background light enough without bleaching out the foreground flowers. This painting will be available here on my website for only a couple of weeks. Since this scene presented so many interesting challenges, I decided to take a few extra pictures to share. 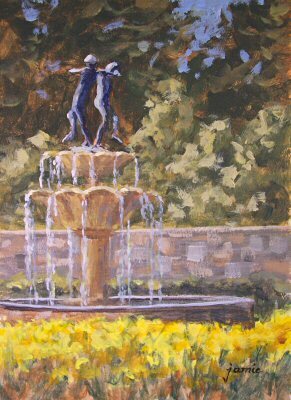 I was immediately drawn to the strong contrasts, and the L-shaped composition created by the flowers, fountain and figure. I also love painting stone walls, so it was a plus to have that in the composition as well. Fitting all this onto a 5×7 panel didn’t prove to be easy. 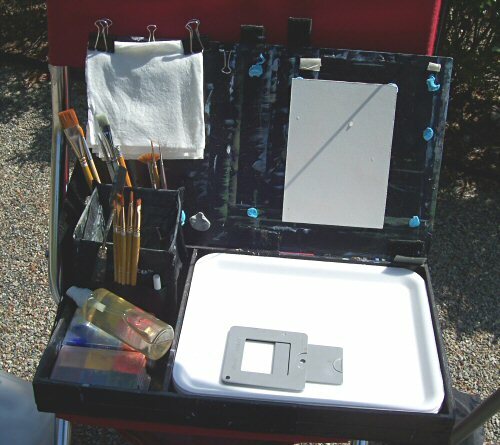 Here’s my pack stool and lightweight painting box. The umbrella clamp is affixed to my stool. I was using a Pittman bag, which can hold my box flat so the paint won’t shift as I change locations. 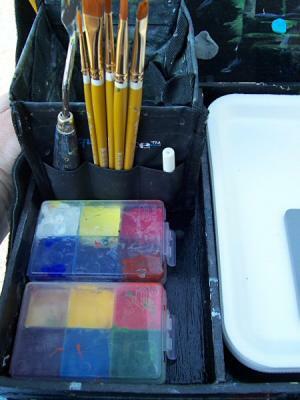 My panel carrier and extra paints fit in there too, and even the umbrella. Here’s a closeup of the box, ready for paint. The panel is affixed to the box lid with blu-tac. It works great. The panels and paper stay put, and there are no clips or clamps obscuring parts of the painting surface. My paper towel is clipped onto the box lid to allow more room alongside the palette for paints and my sprayer. The plastic paint storage containers were purchased in the camping section of Sports Authority. They have a rubber seal around the outside so the paint stays fresh. I find it much easier to set out paint this way, rather than having to search for a tube and open caps. 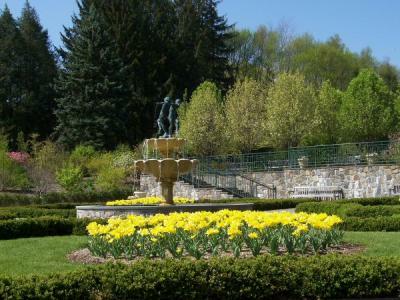 I also carry quinacridone magenta with me for these garden scenes. Whoever said that every painting has to have an ugly stage sure knew what they were talking about. There’s mine! I toned the upper part of the painting with transparent red oxide, and painted the figures a dark, greyed blue. That way, even in the underpainting, I could judge the figures more carefully. Then I worked in the green background. 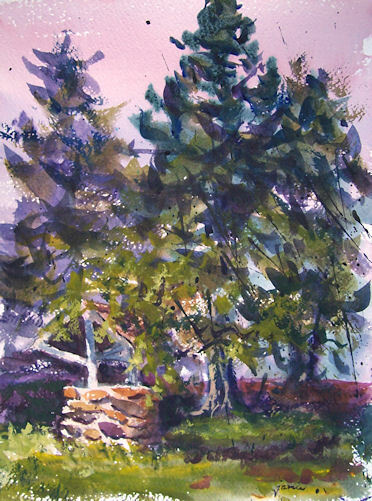 I blocked in the area of strong yellow below to reserve it—-a useful tip given to me by wonderful plein air artist, Lee Haber. From there, it was lots of fun getting the painting to emerge. I feel like my painting process doesn’t really get underway until after this block-in step is done and I have a layer of paint down. Getting this much done didn’t take all that long, but I forgot to stop and get more pictures once I got past this beginning stage. It did eventually get done. I started another painting later in the afternoon, but it started to rain and I had to pack up. I’ll finish it from a photo on a rainy day later in the week. I hope you’ve enjoyed these extra photos! With the cherry blossoms gone at Boscobel Restoration, I turned my attention back to the Hudson River, and the channels weaving through Constitution Marsh. The afternoon light turned the marsh a beautiful, dark reddish color. I used three of the new Golden OPEN Acrylic colors coming out this month for this painting: Diarylide Yellow, Quinacridone Crimson, and Prussian Blue Hue. I also added Raw Sienna and Cadmium Yellow Primrose. I love these new colors. If you think you saw this painting before recently, it’s because you have! I posted it a couple of weeks ago, but decided to do some additional work on it. While I was painting on location, a wonderful ship went by out on the river. It was too early in the process to put it into the painting at the time, but the more I thought about it, the more I wanted it in the painting. I added the ship the other day from a photo, and reworked a little of the foliage too while I was at it. Here’s a photo of my setup and the painting with the scene, before I put in the ship. It’s always fun to see the painting and vista together! I dragged myself out of bed this morning with a sinus infection, ear infection and strep throat (That’s why you haven’t seen any paintings coming off my easel for a few days!) and drove to Garrison to participate in the twice-a-year Artists on Location event. It was cold and windy along the river. 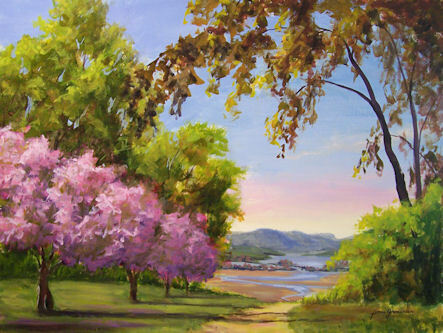 I didn’t want to travel far to do my painting, so I set up right on the landing behind Garrison Art Center and painted this view of West Point. 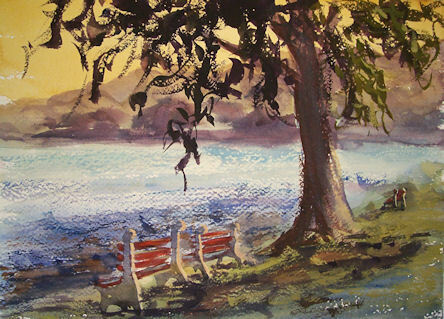 I loved the way the deep shadows cast by the foreground trees set up the painting. There were several other artists painting on the landing too. Everybody was having difficulty holding onto their stuff with the stiff gusts of wind. 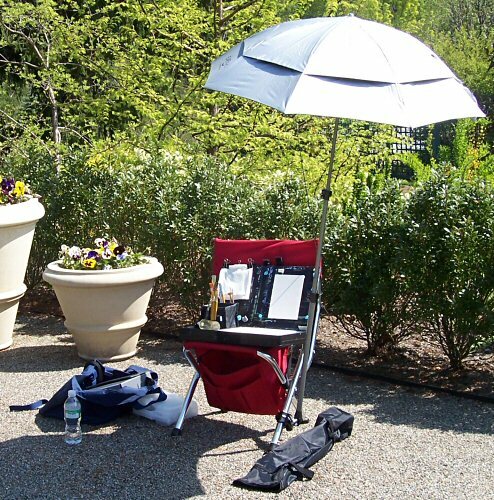 Several paintings blew off the easels and of course we couldn’t use our sun umbrellas. I was cold and not feeling so great already, so I just did a small panting, finished it up as quickly as I could, framed it in the car, and brought it into the auction venue. Of course, leave it to me to forget my camera. Grrrr! 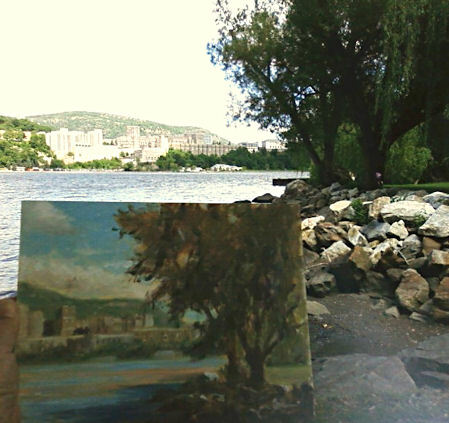 I took a quick photo of the scene and painting with my camera phone, since I won’t get it back again to photograph it if it sells at the auction. The painting ended up in the shade with most of the scene in the light, so it looks dark, but is not in real life. My phone takes terrible photos; it also can’t focus on something this close, but at least you get a little idea of what I did out there this morning. The auction is at 5:30pm tonight. 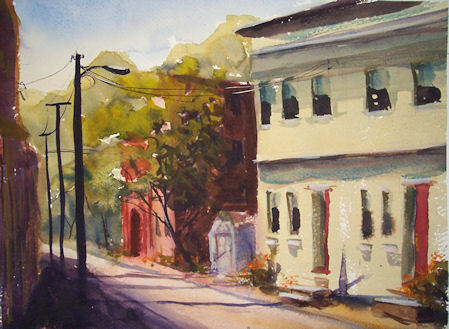 This street scene of Coxsackie, NY, was painted last week during my one week workshop with the amazing Alvaro Castagnet. We all scattered about the little town, painting these beautiful old buildings near the Riverfront Park. I’m looking forward to exploring more of Alvaro’s techniques and subject matter in the weeks to come! 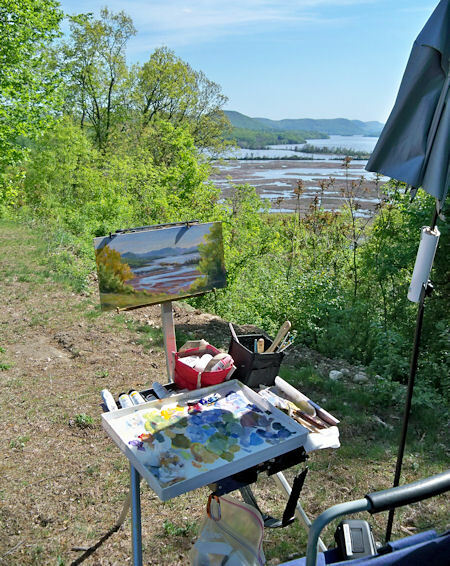 It was so windy along the Hudson River that my easel kept blowing over! I liked these benches under the big tree, awaiting visitors. The Athens Lighthouse is visible from this vantage point, but I decided not to put it into the painting. Initially I’d thought to include it, but in the end I thought it would be a distraction. This painting is matted to 20×16″, with an archival custom ivory mat and backing board in an archival polybag, to fit a standard 16×20″ frame. The painting itself is 15×11″, Watercolor on Fabriano Artistico 140 lb paper. $490.00 plus $30 shipping and insurance within the Continental United States. For local sales, shipping charge will be allocated to NYS Sales Tax. Please email me at JamieWG@aol.com for International purchases or with any questions. This little stone well caught my attention as it stood out in value and texture from amidst the tall evergreens.